DICKINSON, N.D. --- The South Dakota School of Mines women's volleyball team dug deep Wednesday night to defeat the Dickinson State Lady Blue Hawks, 3-2, during a non-conference match in Dickinson, N.D. Trailing, 11-14, in the final set, the Hardrockers rattled off five-straight points to win the frame and the match thanks to the serving from freshman Shyann Bastian and the offense of fellow freshman Dana Thomson. SD Mines defense also played a big part in that span as sophomore Emma Eckle recorded a key block down the stretch. Bastian added a service ace and Thomson delivered a pair of kills to earn the victory. The Hardrockers won the match, 23-25, 25-17, 18-25, 16-14. SD Mines finished with 61 kills on 185 attacks for a .146 hitting percentage. They added 57 assists, 88 digs, 10 aces, 88 digs and 12 total blocks. Dickinson notched 49 kills on 175 attacks, had 42 assists, 78 digs and 17 total blocks. 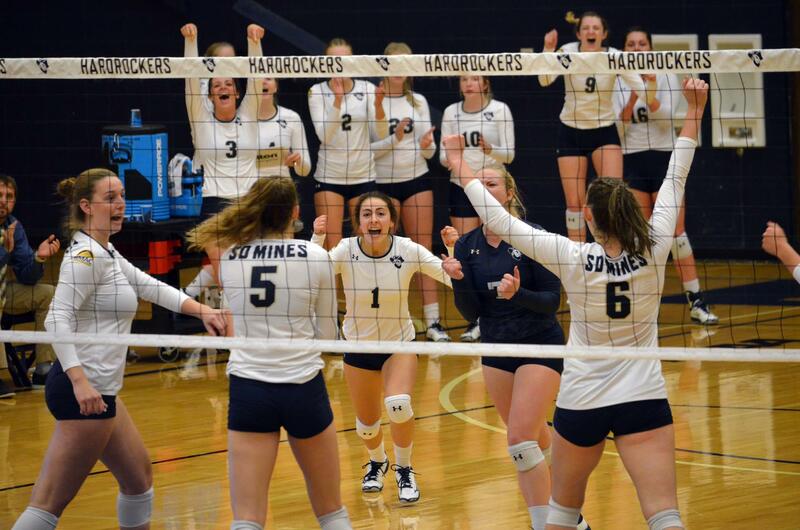 Thomson had a another big night for the Hardrockers posting 23 kills on 62 attacks for .161 hitting percentage. Senior Anna Breidt also delivered for SD Mines with 16 kills on 42 attacks for a .214 hitting percentage. Junior Hannah Stevenson contributed with 10 kills on 23 attacks for a .261 hitting percentage in the winning effort. Eckle led the 'Rockers with 29 assists and came up with 17 digs while Bastian added 24 assists and 12 digs. Sophomore Tana Dahlberg had a game-hight 22 digs and junior Makinze Maiden tacked on 17 digs.